Our company offers complete kit (design + materials + installation) for metalic structures with all shapes and sizes, not imposed framing certain predefined types (length, width, height). The main goal of MeCAD is to optimize the construction of the design because the components are designed in accordance with machining and assembly technologies. Between the years 2002 - 2015 MeCAD has made over 170 projects, totaling approximately 190,000 sqm industrial and commercial buildings. It looks lika a familiar question? All who are at the very first building investment have this dilemma. But those who have already built one or more and the results were not as standby or money spent, have the same problem. - talk to a manufacturer looking for a designer, a supplier of materials ... and you end up above ..
MeCAD tried and managed to simplify this. The basic principle is that a project for a metal structure can not be done properly if you do not know where materials are made. Why? 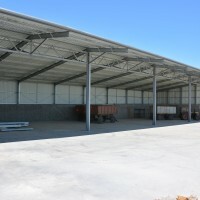 Because the market there are plenty of materials (galvanized profiles, europrofile, rolled, etc.) and solutions (elements with full heart, latticed elements), that the designer can combine to get an optimal solution. Thus to achieve a must to supply construction materials to factories. Each plant has its execution procedures, blanks overall conditions and different quality, etc, which a designer can not foresee. 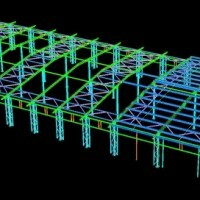 Therefore, MeCAD took these issues and by working with several suppliers to provide a unified solution, project + material and the customer receives on the site all materials that compose the building. That long chain of intermediaries and companies is eliminated, and the correspondence between the project and materials is guaranteed. 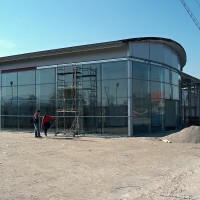 Thus we see the realization of metallic constructions: the designer is conducting the project in accordance with all requirements of the customer and designer coordinates the supply of materials, from collaborating firms that were verified in time as the reliability and quality of the works. Logistical effort is quite high, but the results are seen. But mostly we enjoy as our beneficiaries are happy! And the large number of projects executed and built prove it. So, before starting a new project, think several times. Would you like to become your project manager and put together designer, builder, material suppliers, etc? Or perhaps at lower cost, someone will optimize this activities and you can handle what you do better? Do you think it can be simpler?